Public healthcare is indeed a must in today’s society. With a lot of diseases and viruses that are spreading around the world, we must ensure that our lives are accounted for in the form of hospitals, clinics, and other healthcare facilities. Pregnancy and the delivery of the baby is one of the most intricate and beautiful operations in those facilities. Imagine the new hope for the parents, the birth of something magnificent and the continuation of humankind itself in one baby. But when things go awry, someone must answer the call and report it one way or another even online. Here’s what we got from a Facebook post. ), we can see that she is complaining about how the hospital treats the newborn babies. 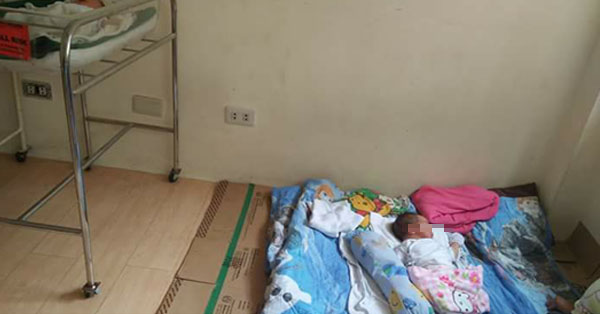 She said that once given birth to the child, they place the baby on the floor with simple foam and cardboard boxes as the baby’s bed. 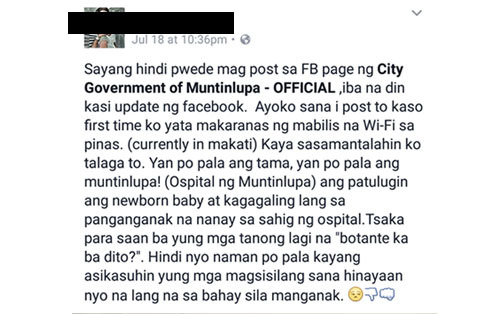 She complains about why they ask if they are a voter in Muntinlupa if they will just treat their newborn babies like this. We really could see that the current situation of the baby is not great. Babies are fragile and sensitive that they need the utmost care possible in order to make the baby healthy and free from illnesses. We do sincerely hope that this is the last time we see this hospital doing an improper job for their patients.